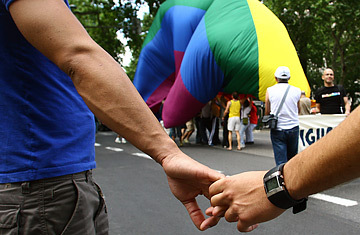 Activists participate in the Gay Pride Parade in downtown Lisbon, Portugal, June 24, 2006. The old and often bitter debate over what causes homosexuality took an unexpected turn this week in the wake of comments by a leading conservative Christian theologian, who says fellow evangelicals should accept that science may one day prove homosexuals are born gay. "We sin against homosexuals by insisting that sexual temptation and attraction are predominately chosen," wrote the Rev. Albert Mohler, the influential president of Southern Baptist Theological Seminary. Mohler's position is a startling departure from years of insistence among fundamentalists that gay rights advocates are wrong when they say homosexuality is not something they choose. Even more surprising, perhaps, is the implication of Mohler's statement that science can help inform Christians' response to moral questions  a rare admission among evangelicals. "The Al Mohler example is certainly a departure," said President Richard J. Mouw of nondenominational Fuller Theological Seminary in Pasadena, the largest evangelical seminary in North America. "Evangelicals, and I am one, haven't always exhibited very clear thinking about science and spirituality." Indeed, evangelicals have for years defined themselves in large part by their insistence that every word in the Bible is true  no matter how strongly science may suggest otherwise, according to Dr. Bruce Prescott, executive director of Mainstream Oklahoma Baptists and one of Mohler's sharpest critics. "I wrestle with Al Mohler all the time; he is one of the key leaders of the fundamentalist takeover of the Southern Baptist Convention," Prescott said. "But I think this might be the first chink in any of these leaders' armor. At least it suggests that they are trying to reconcile science and scripture.... The first step is to realize science has something to say." In an interview with TIME, Mohler said his statement on gays does not change his views on the morality of homosexuality. "There has been among evangelicals a fear or a misunderstanding that if a scientific causation of homosexuality were discovered that that somehow removes the moral responsibility of the persons making these choices," he said. "But that is not true. The Scripture doesn't say we are responsible only for the temptations we choose. The basic sinfulness of homosexuality, that wouldn't change." Political philosopher Charles Taylor said Mohler's comments show he is capable of setting aside strongly held notions in the face of scientific evidence  which he called refreshing. "Both science and religion can be very much perverted by ideological beliefs. Both need to be purified," said Taylor, who on Wednesday was awarded the $1.5 million Templeton Prize for a career spent arguing that fields such as history, politics and economics pay too little heed to spirituality as a real force in people's lives. Taylor said it is evangelicals' insistence on the literal truth of the Bible that leads them to too often belittle science and at the same time overlook more fundamental truths expressed by the Bible's use of deeply powerful myths and metaphors. "When we say God is the Father, we aren't trying to say he is like my dad," Taylor says. Still, Mouw is troubled by other aspects of Mohler's comments about homosexuality. If science proves homosexuality is caused by genetic or other biological reasons, Mohler wrote, it's only a matter of time before science produces a treatment that will cure it. If so, he said, Christians have a duty to use it. Mouw says Mohler went too far in endorsing the concept of a prenatal treatment for gay fetuses. "Evangelicals have generally been very nervous if not openly opposed to any kind of genetic manipulation, " Mouw told TIME, "certainly against producing designer babies, where you have a choice of blue-eyed or green-eyed babies. Why in the world would we now want to advocate designer orientations?" Mohler responded that he opposes genetic manipulation of all kinds. His point, he said, was that if a hormone therapy were developed for fetuses that would help them be born straight rather than gay, he would support its use, just as he would support medical treatment to give sight to the blind fetus. That's what has angered gay rights advocates, and overshadowed Mohler's concession that homosexuals may be born that way. "What is wrong with Mohler's argument is that it implies that there is something wrong with being gay," said Joe Solmonese, president of the Human Rights Campaign. "I would welcome the fact that they are beginning to concede that homosexuality is not a chosen lifestyle. But it is hard for me to believe that anyone that would then conclude that our next step ought to be to get about the business of changing everybody is really offering any sort of enlightened view."